Smith Square, where Europa Nostra UK’s annual meeting will take place. Photo by falling_angel. This year Europa Nostra UK‘s annual meeting will be an afternoon/evening event, including our AGM, the 2016 Duncan-Sandys Lecture and a very special party to celebrate and to honour the long association with, and great contribution to, Europa Nostra of some of the organisation’s more senior members. 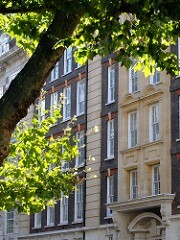 The meeting will take place at Smith Square in London. Invitees will include (in alphabetical order!) Sir Christopher Audland, Dr Lester Borley,Lord Cameron of Lochbroom, Sir James Dunbar-Nasmith, Sir Donald Insalland Mr Cyril Morris. The honorands have agreed to reflect in conversation on their involvement with Europa Nostra and heritage matters in general, and on their hopes for the future. The Duncan-Sandys Lecture will be given by Professor Michael Dower, formerly and in turn Director of the Dartington Trust, Director of the Peak National Park and Director General of the Countryside Commission. On reaching retirement age, he was appointed full-time professor at Cheltenham and Gloucester College where he has combined teaching with research and action projects all over Europe and in Vietnam. Europa Nostra UK warmly welcomes non-UK members to its events.